reduces the number of renewal orders since it’s no longer necessary to create multiple orders for what may be a single shipment. Combined with the use of a dedicated post type for creating and managing subscriptions, v2.0 is a stepping stone for introducing new functionality such as personalized subscriptions and subscription bundles. Composite Products, for instance, is typically used to create configurable product kits that consist of multiple, grouped products. No matter what you want to sell, from ties and grooming products to undies, personalization and bundling techniques can help your subscription-based business target its audience much more effectively. The release of Subscriptions v2.0 finally makes such long overdue integrations possible: Stores that rely on Composite Products, Product Bundles and other grouped product-type extensions, such as Mix ‘n Match Products, may soon be able to offer subscribed versions of their products. How soon? Well, if you like life on the edge, right now! Today, we’ll be taking a first look at an experimental mini-extension developed to bridge the gap between grouped product-type extensions and Subscriptions: Subscribe All The Things. Subscribe All The Things, which is co-authored by SomewhereWarm and Prospress, provides basic subscriptions support for non-subscription product types. It allows you to attach subscriptions to Simple products, Variable products, Composite Products, Product Bundles and Mix ‘n Match Products, and includes a neat feature: The ability to switch any product from a one-time purchase to a subscription, even after is has been added in the cart! The best part? The code is already public – so you can start testing, sending feedback and contributing to the plugin right now. The catch? The code is still in pre-beta status: Some, or many things, might not work as expected. You might stumble upon bugs, lose data, or even find the code to be completely unusable. To give you a quick idea of what’s possible with Subscribe All The Things, we’ll start with a Simple Product: A modest Bag of Raw Almonds. 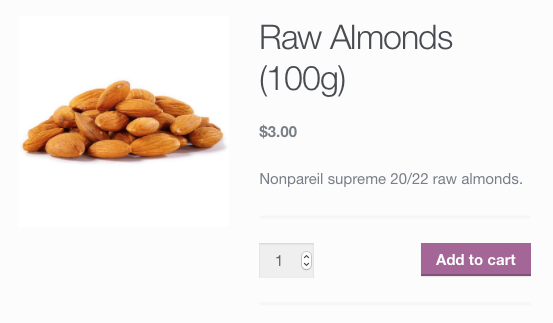 Simple Product: Raw Almonds Bag. Editing the Raw Almonds Bag Simple Product. 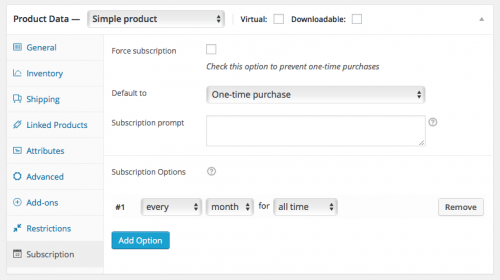 tweak some other options, such as the “Choose a subscription” message, displayed when attaching multiple subscription options to the product. Added a single subscription option: every month for all time. Buy one-time or buy as sub? 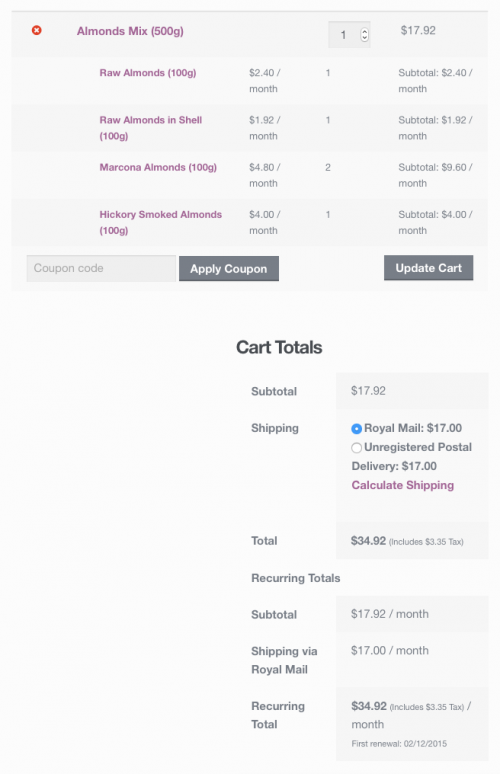 Choosing between a one-time purchase, or a subscriptions – this time, in the cart. Think it’s a sub? No, this is just a Simple product! A pick ‘n mix almonds subscription. 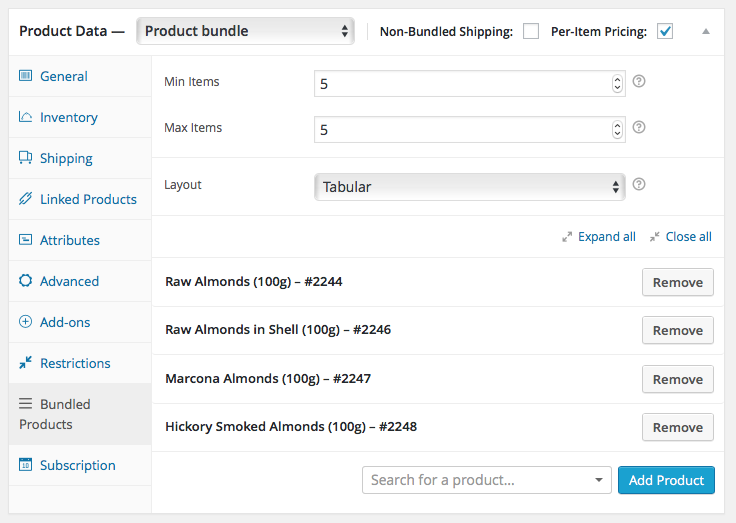 Setting up the Almonds Mix subscription bundle. Note that a similar result can be obtained using the amazing Mix ‘n Match Products extension. Setting up the Almonds Mix subscription bundle: A look at the Subscription tab. 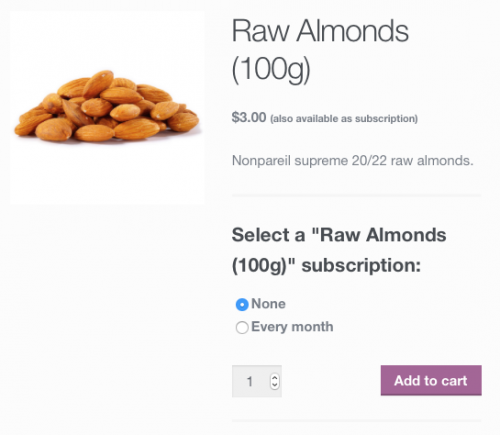 The Almonds Mix subscription bundle in the cart. A subscribed bundle of physical products, for real. Subscribe All The Things by SomewhereWarm and Prospress finally makes it possible to attach multiple subscription options to physical or virtual products regardless of their type. Currently, it includes support for Simple products, Variable products, Composite Products, Product Bundles and Mix ‘n Match products. The code is in beta phase and is already available publicly for testing, feedback and contributions by the WooCommerce community! Currently using Subscribe All The Things with Product Bundles and it’s basically exactly what I was looking to achieve for one of my clients and I love what I’m seeing so far on my staging site. I wanted to see if you guys had a date that Subscribe All the Things would be out of pre-beta and be officially supported? My client is also really liking what they see and really want to switch to the new format (Products Bundles with Subscribe to All the Things) as well. Thanks for the feedback! The main reason the plugin is still in beta is that it’s not yet “battle tested”. The more feedback we receive (comments like this one, bug reports, feature requests) the sooner it will move out of beta. Note that bugs and issues can be submitted to the GitHub repo, which is regularly viewed by both teams (SW and Prospress) — so the plugin IS supported. However, there is no “premium” support on offer, which makes it only suitable for use by developers who can support their own clients, if an issue comes up – another reason for the “beta” label. Is it possible to add a discount to subscription option as compared to one-time purchase to incentive user to subscribe? This is an important feature. 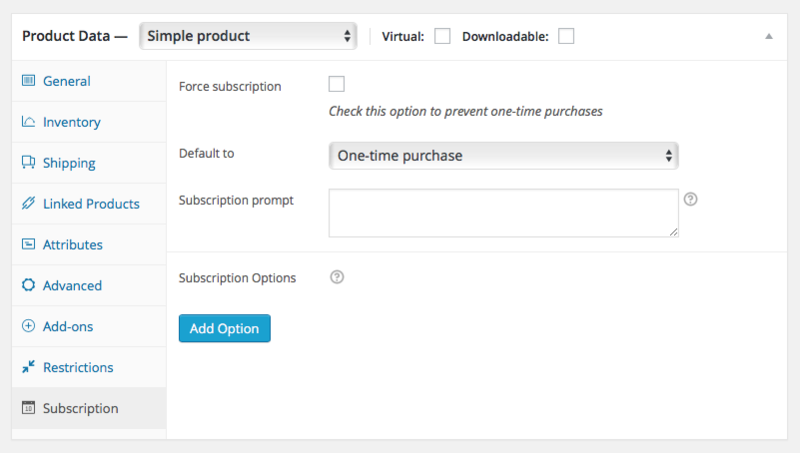 your plugin description clearly states that it supports both simle products & variable products – but when i am in a variable product the subscription tab disappears???? what am i doing wrong? Variable products are supported in v1.1, which is a couple days away from being tagged/released. loving this plugin in general, works as i expect & need I mostly use the update products to subscription feature in the cart as my customers are repeat business and it’s pretty easy to educate them that they’ll always have that option without adding specific settings to hundreds of products…. 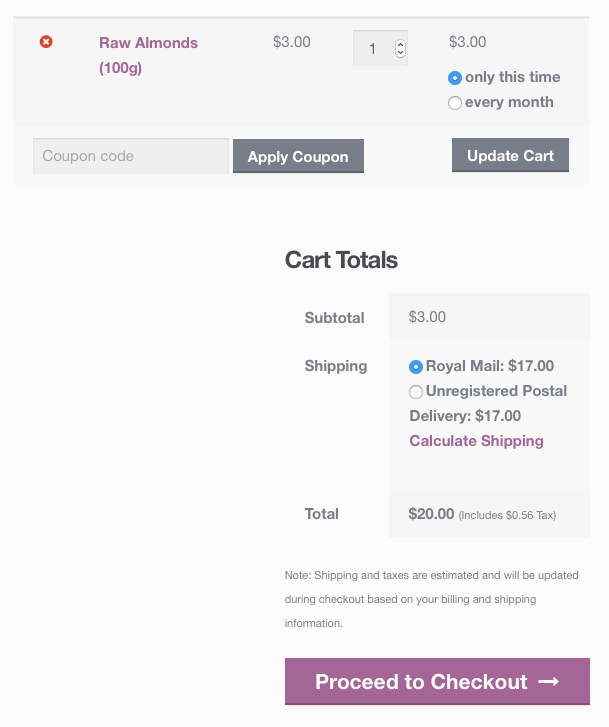 One thing – I use chained products to create a linked bundle and if I allow the chained items to show in the cart statt allows my customers to subscribe to each item in the chain (at their price of 0.00) as it would paid items but sttrangely not the overall bundle… My workaround has been to not SHOW the chained items in the cart but this may not work if someone is utilising chained items differently than i am. 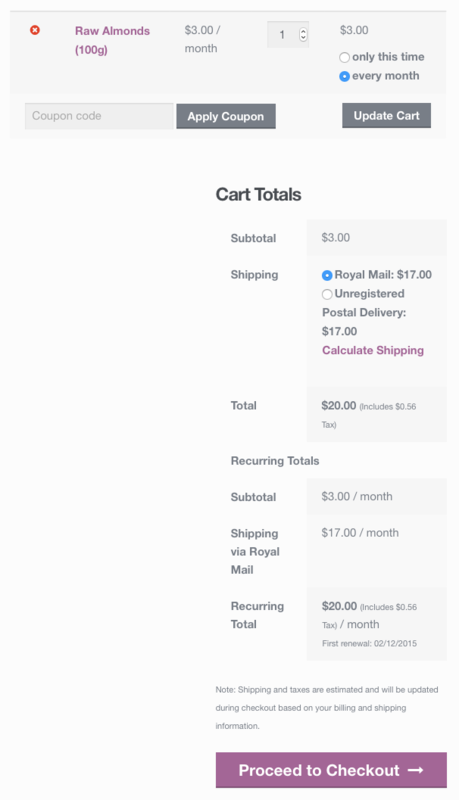 using these babies in conjunction make the go to checkout button and the radio button options for statt disappear in the cart page…. Thanks for the feedback! Due to the nature of SATT and the way hooks/filters work, compatibility with other official extensions is a big challenge, let alone 3rd party plugins. For all intents and purposes, SATT should be considered to be compatible only with extensions for which compatibility is explicitly mentioned in the readme.txt file or change log (Variable Products, Product Bundles, Composite Products and partly Mix and Match). Ideally, in the future we would like to support every official extension, but there are practical limitations that may often require work on both ends. For the time being, SATT should be considered as an “experiment” mainly due to the complexity and fragile nature of its integration with WooCommerce Subscriptions. When is this plugin expected to get out of Beta and go into production and become available for sale? Of course, it goes without saying that using e-commerce software without having access to support is only wise if a developer can readily help you diagnose and fix any potential issues. We understand that for most store owners this is not a realistic option, so we are looking at a few different alternatives and, hopefully, soon we’ll be able to fully support SATT. 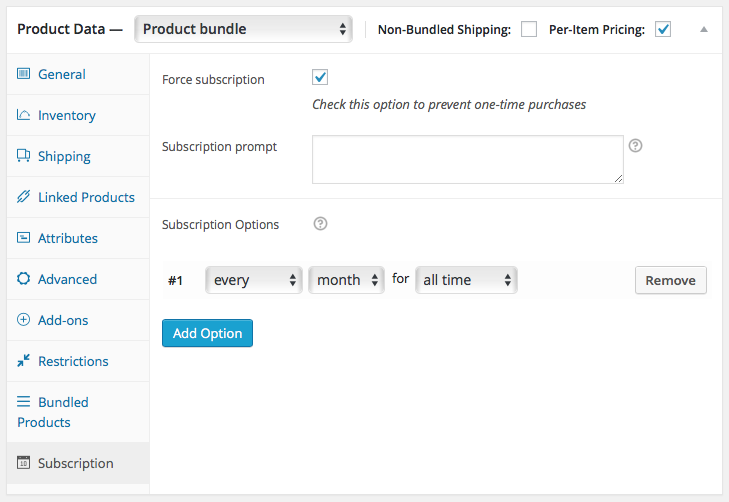 Is it posible to disable the part of the functionality, that shows the ability to subscribe for regular products on the check basket page? I have some products where it makes sense to show this, but unfortunately not all product should show this possibility, but I can’t see an option to turn it off for individual product (or just turn it on for individual products).